What a morning. 3 times in row waking up in a hotel makes us spoiled. Once again the fruit loops had to suffer under my attack and of course the waffles too. We had a short meeting, stocked some pastry for on the road and left for Fort Nelson. The landscape changes a lot going up North. The nature looks rougher and untouched! It’s beautiful! 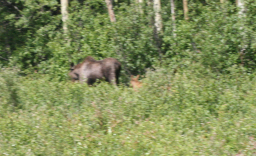 Driving through the wilderness we saw a beautiful moose with a cub. Probably there is much more wildlife to come. In the late afternoon we arrived at a truck stop called Bucking horse river lodge! We were welcomed with open arms and offered a great lunch + sponsorships. What an awesome place, beautiful nature, nice people and delicious food. What would you want more? Thanks to Howard, his wife, Lance and his wife we had a great time! Around 11:30pm it was still light outside so you hardly notice that it is time to go to bed. Claire, Marcelo and me were sleeping in the trailer and as usual we turned it in to a zoo, laughing our eyes out. We always have problems finding flashlights to light up the trailer so I got a little bit anxious asking Marcelo why there isn’t a switch. Immediately he gave me a switch but I didn’t ask him for a switch that turns on the light what I should have done of course. There I was holding the switch that didn’t bring me a step closer to the light. Marcelo did give me what I asked for :-D The night ended with one of my specialties. I definitely turned on the Dutch oven. Another night in another Super 8! We are in Fort St. John. I went to bed as soon as we got in last night, after Willy helped me to the room and started a bath for me. I don’t know what is going on but it is getting worse. It started as shoulder and neck pain, like wings were sprouting from under my shoulder blades, then fever and chills, then I started feeling nausea and I just can’t get enough sleep. I’ll sleep 12 hours and still wake up exhausted. Boo. But we get more waffles for breakfast! In the van I take it easy and work on updates. I spot the first moose of the tour! It’s a momma and her two babies. I try to get Josh’s attention who is walking back to the van from filming, but he is oblivious and misses them. We pass Sasquatch crossing...exciting. I sleep in the back of the van and wake up in Buckinghorse River. We stop and end up getting sponsorship from the lodge and restaurant owners. A new decal gets put on the trailer- a bucking horse and we get a hot meal! Veggie omelette...yumm! Josh pauses his vegetarianism for a local buffalo burger. After munching and chatting I start to feel weak again so I return to the cave for more rest. I wake up to Willy playing the new song Josh taught him on the ukulele, then back to dream land where my body is unaffected by pain and suffering. Happy Independence Day America! As a fifth generation Floridian, I'm about as patriotic as they come. I even studied politics in college. This is certainly my first Fourth of July in Canada, and learning to love my neighbor has never felt so relevant. The team left the Fort St. John Super 8 bright and early, but not before having a waffle, and checking the weather. I grabbed a quick shower, seeing that it was slightly overcast, and that we might not be somewhere with facilities for a few days, depending on the weather. So our team hit the road, mounting the new video camera atop the solar car for taking footage. The team was on the road with Fort Nelson set as the destination. It was pretty much a straight climb on the Alaskan Highway. We crossed beautiful river valleys, and finally made it to Buckinghorse after draining the batterty about halfway. Almost immediately, we were asked by the owners of Buckinghorse Ranch if we needed a sponsor. For $500, we added the first sponsor for the solar car tour in some time. They added a horse decal to the trailer, and the solar car project became sponsored by Buckinghorse Restaurant and Truck Stop. It was nice to meet some real outdoorsman, with tales of bears, hunting, and raising horses to keep us city folk in awe. I encountered a major dilemma at dinner. Buckinhorse was kind enough to also sponsor us with a complimentary meal. Although I've been eating vegetarian meals consistently for the majority of the solar car tour, it turns out that it takes more energy to import vegetables here, than it does to support a local buffalo hunter. I've never eaten buffalo before, and a chief ethical motivation for my being vegetarian has been to support local food, while not supporting factory farms. I also made the decision to only eat meat if it was prepared locally, respectfully, and sustainably. So I finally succumbed to eating meat after long abstaining from it on the solar car trip. I felt good that at least the burger I ate on July 4th had less of a carbon footprint than one of the vegetarian items I could have chosen. I even tried poutine, knowing finally that even the gravy was locally and sustainably prepared. Later on, Willy, Marcelo and I took down the array. I showed Willy the chords for "House of the Rising Sun" on the ukulele, and we talked a bit with some of the owners of Buckinghorse. We even met a couple of people who were warning us about the sharp shale gravel roads leading up to Inuvik. Fortunately, we have plenty of spare tires available. I interviewed them for the documentary while warding off dozens of attacking mosquitoes. I then went inside and talked with the new sponsors about the potential for renewable energy implementation in British Columbia. While wood fire and hydro electric seem to be the only consistently viable options available to them, it is still difficult to procure power, seeing as much of the power is outsourced to the US and Alberta. This is mainly because B.C. is more efficient in producing lumber, and so they can sell their raw materials cheaply, while the manufactured product can sell for more money. I found it interesting that this parallels a similar tension between Britain and America during the revolutionary war. Britain would sell finished products to Americans at an incredibly inflated price compared to the original raw materials. For economic reasons such as these, it was necessary for America to declare her independence. Having this conversation with some of our next door neighbors in Canada really does take the phrase "love thy neighbor as thyself" to a new level. If we are to succeed as a people, a nation, or a world, we must unite against unsustainable, costly, and unnecessary commodification of basic needs to the point that local people cannot even properly profit from what literally grows in their backyard. The profit seeking mechanisms of major corporations are natural to the goal of a corporation, but not to the environment or it's people. It's great to have support from an organization that, although they are forced to use propane gas due to their lack of any proximity to a hydro power station, they support local industries as well as the solar car project. They truly embody what I believe to be the intent of thinking globally and acting locally. It's great to have Buckinghorse as a supporter, and it was awesome to get to talk with some real Canadian patriots about Canadian politics, and breaking down the barriers between American, Canadian, rich, poor, black, white, young, old, or otherwise. As one living planet, we must certainly stick together, or fall apart. LET IT BE KNOWN THAT TODAY IS NOT ONLY THE BIRTHDAY OF MY SWEET AMERICA, BUT OF COMPARATIVE IMPORTANCE IT IS ALSO THE DAY I SAW A MOOSE! We saw it trot along the bush with two cubs close behind as we were parked on the side of the road before reaching Pink Mountain. I had a very strange reaction to the sight of it. I truly did not know what it was. I was excited at the sight of such a big animal, but I was confused because my brain couldn't put a name on it. Before you assume I was raised in a shoebox, I will say that it did not have those massive antlers, the sole icon many a tourist define a moose by. No, female moose prefer not to carry such a heavy load. After the initial thrill subsided I grabbed my phone to text everyone about the celebration to be added to the Day of Independence, but no reception. I sent some excitement telepathically instead, and with the time change and all they should be receiving it soon. It was so very cool. After getting up early to set up the sunrise, I went back to the room to work on the website. I showered, had my now daily intake of waffle and started packing up the trailer. We had a quick photo opp with the Super 8 staff and Greg from Mr Mikes and then we were ON THE ROAD AGAIN! Same story, gorgeous landscape and stunning skies. I can't believe I never thought to go to this part of the world, I had practically sworn it off...as with every other place that requires closed shoes. We got to Buckinghorse River Lodge in the late afternoon, but at the time I considered it lunch time based on the amount of light in the sky. I thought we were just going to stop to charge up and work on the computers, but that would be too safe an assumption. I found out that the family owners, Howard, Lance, and their wives, decided to sponsor us $500 and place their logo on our trailer, PLUS free lunch/dinner (Delicious, THANK YOU) and a spot on their grounds for us to camp out on. Dinner was a good time, especially talking with Howard, Lance, and Juan...about the land, the animals, the winter, and a bit about them, too. Getting ready for bed, Marcelo, Willy and I had a good share of belly laughs...some at my expense, but it usually evens out in the end. Marcelo and I worked on the computer a little while Willy mocked sleep knowing he had to get up early. HAPPY FOURTH OF JULY and CLAIRE FINALLY SEEING A REAL LIVE MOOSE DAY! Claire and Josh aren't exacty sociable right now, especially with a chirpy Marcelo! Oh. 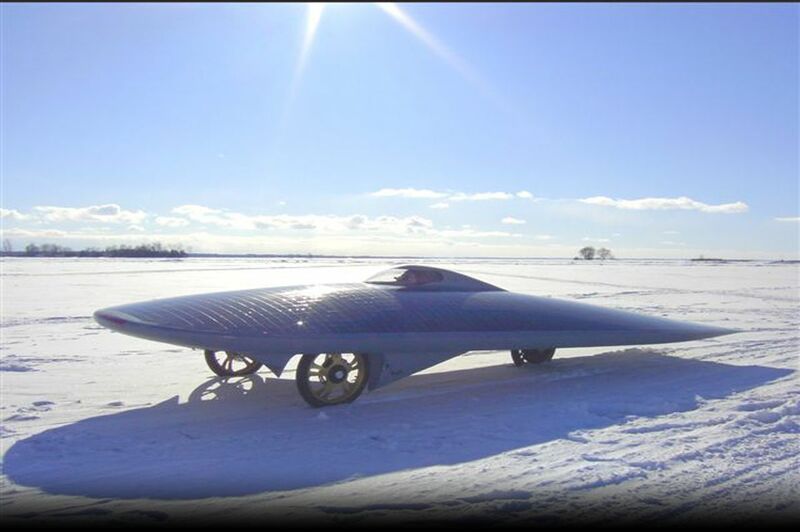 THAT solar car. (tucked behind Mr Mikes). The morning sky shows blue slowly making its way through all that white. Soaking up energy outside the Super 8 breakfast room. 4.0 amp hours before 6am!! Thank you Super 8!! Another wonderful stay for the solar crew. Greg, thank you for addressing our crew's sirloin deficiency! It was delicious! Thanks Mr Mikes! Definitely something to stop for. The tree coloring looks pretty, but its really evidence of the devestating pine beetle. Kicking up water just like the rest of us do. 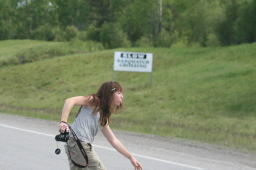 Claire hurries back from the bush to get the shot! Always another hill to climb. I think we are going for a bit more...remote. Claire fixes her bandage while (rather comfortably) waiting for a passing shot. A stop to dump out rain water collected in the fairing. Solar is only part of the answer for positive change. A last look before it disappears downhill. Who knew Sasquach was originally from West Palm, FL. Species of all types run towards solar power. Using nature to move forward. Ready to get back on the road. Feeling better today, Laura gets back behind the wheel. Howard and Lance clean off a spot for the trademark Buckinghorse. Meet our newest sponsor, Howard of Buckinghorse River Lodge. Welcome to the team!! Josh trades a veggie omlette for a more LOCAL dish...buffalo burger and poutine! A bright evening at Buckinghorse. Our neighbors for our stay at the lodge. Meet our newest sponsor, Howard of Buckinghorse River Lodge. Welcome to te team! !